Time for the Mixed Media challenge over at Splitcoast. Our technique today is emboss resist. Haven’t made a tag in ages so thought that would be fun. I started off by stamping the large flourish image, at an angle, with embossing ink. Then it was heat embossed with white embossing powder. Next the bird on the branch image was stamped with Ranger Archival ink in Jet Black. Then I started sponging…Shabby Shutters, Picked Raspberry and Squeezed Lemonade Distress Inks all over the tag. 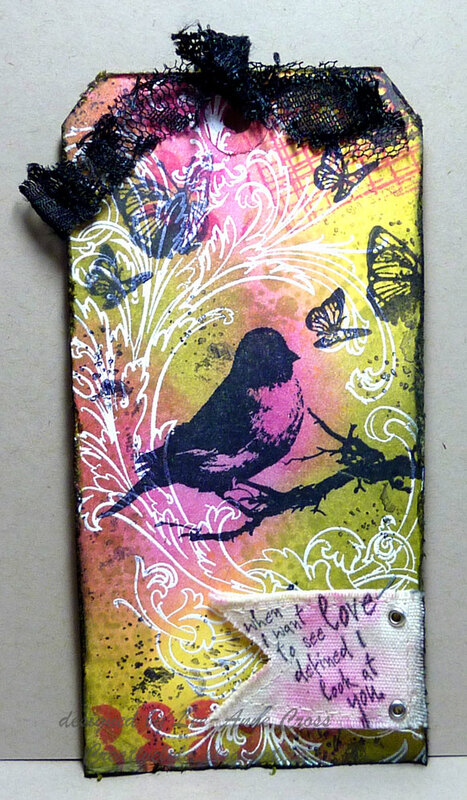 Then I came in with more Jet Black and stamped the butterflies and the splotches randomly across the tag. Using the Picked Raspberry I did it again, this time with a couple of different stamps. I’ve only inked these stamps partially and used my fingers, rather than a block to stamp these areas. I stamped the sentiment on a little canvas banner and inked my craft sheet with a little of the Picked Raspberry, spritzed it with water and dragged the banner through it. It’s been added to the tag with Tim’s Tiny Attacher tool. Finally, I distressed the edged and inked them with Black Soot Distress Ink and tied a strip of black lace through the top of the tag. I love how even though there’s a lot of black on the tag, the bold and bright colors balance it very well.